Goa is famed for its natural beauty, culture and hospitable & secular nature of its people and ranks among the top holyday destinations of the world. It has mesmerising landscape, flora and fauna and has a long coastline with sandy beaches and swaying palms boardering the azure waters of Arabian sea. The villages of Goa with their old churches and temples offer a glimps into the past. The history, traditions and the way of life are truly and exquisitly Goan. Here are a few monuments and beaches of tourist interest. Location: Old Goa, 9 kilometers from Panaji. Highlights: Largest church in Asia, this cathedral has five giant bells and exquisite architecture. How to Reach: One can hire local transport like taxi, auto or bus from Panaji or any other nearby place to reach the Se Cathedral in Goa. Nearest railway station : Karmali. Location: Old Goa, 9 Km from Panaji, in the same compound as the Se Cathedral. Main Attraction: Elements of Hinduism in the church. 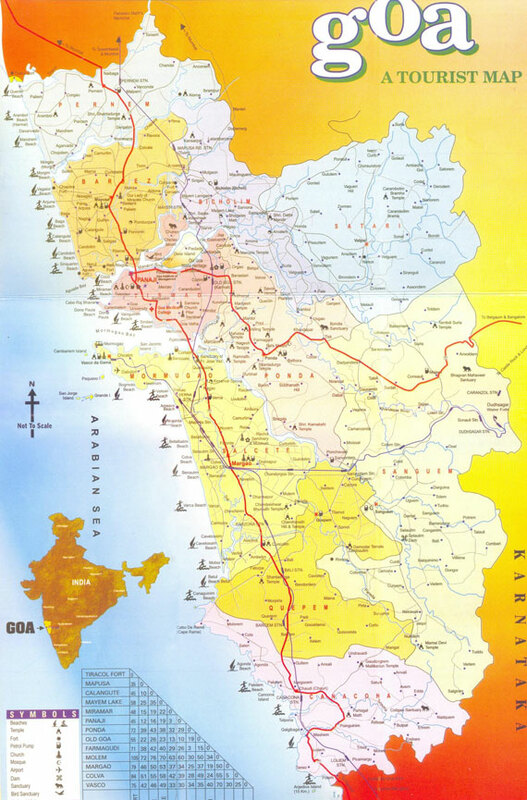 How to reach: Local transport in Goa, which is easily available from anywhere. The Church of St. Francis of Assisi is situated in the same complex, where Se Cathedral is situated. The church is a stunning building, constructed during 1517-1521 AD. A church sanctified to the Holy Ghost was built in 1521 and was later demolished. The present church was then built on the same spot in 1661, maintaining only the foyer of the earlier church. There used to be an educational institution within the church. 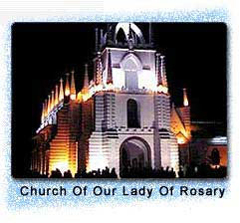 The Church of Our Lady of the Rosary is one of the oldest churches in Goa. It was built in the 16th century. The imposing structure has significant historical importance, which makes it one of the most visited places in Goa. History. The Church of Our Lady of the Rosary stands on the very spot from where Alphonso de Albuquerque witnessed the conquest of Goa in 1510. 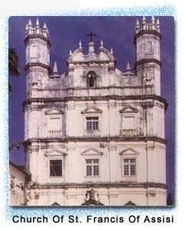 The church was Old Goa's parish church since 1543. It is believed that St Francis would preach here in the evenings. This is perhaps the oldest complete structure in Old Goa. Location: You can easily reach Old Goa from Panaji, in 15 - 20 minutes by hailing a bus or Taxi. You are usually dropped off near the Basilica of Bom Jesus. Taxis or auto - rickshaws are available, which take you to the church. Location: Old Goa, North Goa. History: St. Augustine Tower is a 46 m tower that served as a belfry and formed part of the magnificent Nossa Senhora da Graca Church. It is the only one of four towers that still exists today. 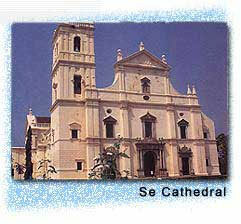 It was built in 1602 by the Augustine friars who first came to Goa in 1587. Initially built of lateritic the Church had four storeys. It was colossal in size and had richly adorned chapels and altars. It also had a convent attached to it. 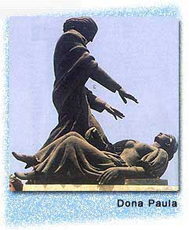 Dona Paula Beach is located just about 7-km from Panaji. This place is called the Lovers Paradise in Goa, named after Dona Paula de Menezes. She was the daughter of a viceroy in colonial India, who threw herself off the cliff, when refused permission to marry a local fisherman, Gaspar Dias a secluded bay situated on the Arabian Sea, the Dona Paula Beach is one of the most sought after beaches in Goa. A meeting point of the Zuari and Mandov rivers the Dona Paula Beach, once a silent village today is one of the most commercialized areas of Goa. 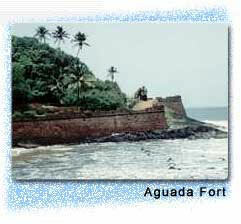 Aguada Fort, which crowns the rocky flattened top of the headland, is the best-preserved Portuguese bastion in Goa. Built in 1612 to protect the northern shores of the Mandovi estuary from Dutch and Maratha raiders, it is home to several natural springs. A spring within the fort provided water supply to the ships that called there arriving after the long sea voyage from Lisbon, giving it the name 'Aguada' (meaning 'water' in Portuguese). Location: 18-km From Panaji, North Goa. 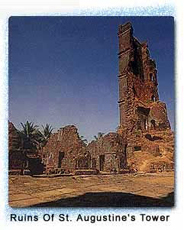 During the reign of Kadambas, in the 13th century, the Goan territory thrived in all directions due to benign administration of the enlightened rulers. Situated in West Goa, the Mahadeva Temple in Tambdi Surla is the state's only prominent reminder of the pre-Portuguese temple architecture. Maintained by the ASI (Archeological Survey of India), this 12th century temple boasts of some fine relief's on the 'Shikhara' (spire) depicting a plethora of gods and goddesses. It was built in the Yadava style of architecture with all the necessary parts, like Garbha Griha, Mukhamandapa, Mini-shrines, etc. and presents an extremely grand look. Do not miss the impressive carved wall near the entrance and the chiseled monolith pillars. 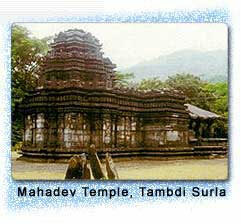 Mahadev Temple is approximately 65 kilometers (40 mi) from the capital city of Panaji. It is accessible from the north via minor roads 22 kilometers (14 mi) south from the main town of Valpoi. The temple is located at the foot of the Anmod Ghat, which connects Goa to the state of Karnataka. Calangute was once the beach Goa was most widely known for, although one or two of other beaches in Goa have now taken that mantle. However, Calangute remains a popular retreat for the Western tourists and travelers that first discovered the region over 40 years ago. Between the beaches of Baga and Candolim lies the 4 mile long Queen of Beaches, Calangute. Distance: 16 Km from Panaji. Anjuna Beach is popularly known as the freak capital of the world and not without reasons. It claimed popularity for its Trance Parties and the Hippies who tried to synthesize the spiritual traditions of the East and the art, ideas and the music of the West. Anjuna is a small village in north Goa, on the shores of the Arabian Sea. It lies 18 km away from Panaji, the capital of Goa. 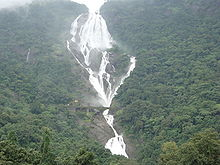 The Dudh Sagar waterfall is situated in the Indian state of Goa 60 kms from the capital city of panaji. Dudh sagar is accessible through buses and taxis from Panaji city. Perched on the lofty peaks of the Western Ghats, the Dudh Sagar waterfalls offer unrivalled beauty and amazing scenery full of exquisite charms when in full flux after the monsoon showers. Dudhsagar literally means ocean of milk. This is one of Goa’s most attractive and ideal picnic spots mainly offering charismatic natural beauty and amazing scenery when in full flow after the monsoons. Even words are too less to describe this stupendous charisma of mythical fascination which is almost similar to a second Eden cradled luxuriously in the mountains. Colva Beach: About 6Km from Margao, Colva beach is the pride of Salcete and the only rival to Calangute by its scenic splendour. Here, sand, sea and sky blend in natural harmony unspoilt by men. Agonda Beach:About 37 KM from Margao. A small picturesque and secluded beach much sought after for its serenity.